On the Fifth Day of APOLLO, My True Love Gave to Me – A Stocking Full of Random Junk, Some of Which Might be Useful! Today we go over one of the stranger databases on iOS, the Aggregate Dictionary database, or ADDataStore.sqlitedb. This database is only available with a physical file system dump in the /private/var/mobile/Library/AggregateDictionary/ directory. The database also has a different way of storing its data. Instead of a “this time this event happened” storage system like many of the other database I’ve gone over. This one aggregates data for the last seven days. It only records data on a per-day basis so the APOLLO modules will only store a day timestamp. This database is good to find random bits of useful stuff, not every case will need it but you might be surprise what it is tracking. The Distributed Keys and the Scalars are each keeping track of seemingly obscure items. In my opinion, the Scalars are more interesting. On my example database I have 5398 unique keys for Scalars and 795 keys for the Distributed table. I can’t even begin to show you everything this database tracks, its best just to take a look at one yourself to see what might help in your own investigations. I will focus here on a few of the more interesting Scalars entries. I’ve previously written about this database with respect to Pincodes, Passcodes, and Touch ID. APOLLO only has two modules for the Aggregate Dictionary. Since these are using only a per-day timestamp, I’ve made them easy to filter out or as a user choose to not use these modules. They can look a tad messy in the final output. The first item I pulled out of the stocking is CarPlay data. The example below shows how many cars I’ve connected using CarPlay in com.apple.CarPlay.VehicleCount. I’ve connected this device to three different cars. I’m still testing the difference between*.CarPlayCar. * and *.tCarPlayPhone. 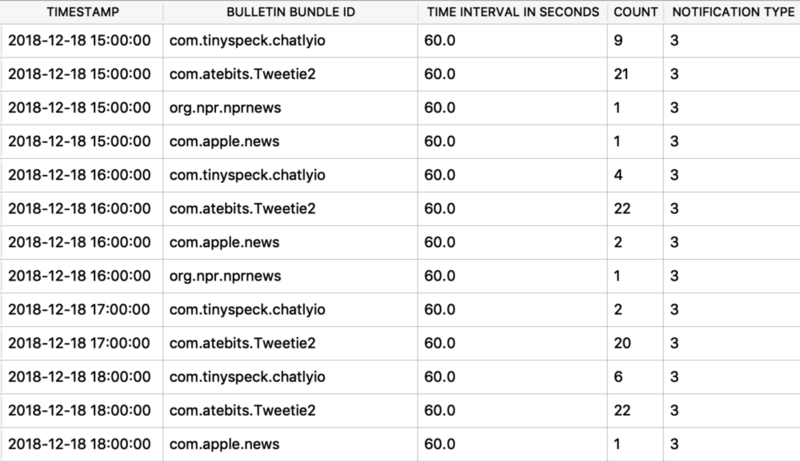 * keys, however I could guess that Activations has something to do with how many times the app was selected while the ActiveTime is how long the app was in use. The next item has to do with the Messages application. This app is collecting metrics on the different types of items sent and received over SMS or iMessage protocols. The Settings applications (com.apple.Preferences) keeps track of which setting got viewed. The example below shows I viewed the Bluetooth menu twice on the 10th, and the privacy settings once on the 14th. I encourage everyone to search for various bundle IDs of interest in this output – you never know what the apps are going to store! The Clock app (com.apple.MobileTimer) keeps track of how many alarms the device has set, if any are active, number repeating, and named alarms. Some apps are better at storing data like this than others. The Photos app (com.apple.mobileslideshow) keeps track of how many photos there are in the albums. Curious how many times a device was plugged in during a day, try the com.apple.power.state.pluggedin.count key. We will revisit this action in an upcoming device state article. When I say obscure, I mean obscure – it also keeps track of button presses…because why not! Some settings are also stored in this database. You can perform a filter for a couple of keywords – enabled or disabled. I’ve provided a screenshot for both. For the “Enabled” keys, I chose to filter on the main interface, Springboard (com.apple.Springboard). The value is a binary value that means on (1) or off (0). This is different for the “Disabled” keys. Finally, in the toe of the stocking we can get some data usage information. I’ve filtered here by the Twitter application (com.atebits.Tweetie2). The screenshot shows how much data was transferred in kilobytes over Wi-Fi and/or WWAN – incoming or outgoing. Looks like Nick is ready to analyze what’s in his stocking!